A new kind of vending machine is being trialled in Dorchester in partnership with Litter Free Dorset. 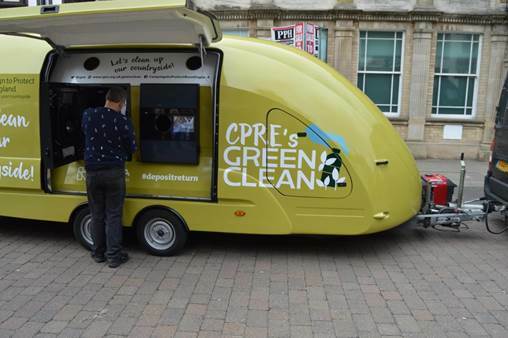 Residents can come and try out the ‘reverse vending machine’ – a new scheme that pays people to pick litter – on Thursday 13 September outside Lloyds bank, South Street. What is a reverse vending machine? The scheme’s being trialled across the country by the Campaign to Protect Rural England (CPRE). Data will be collected on the numbers, sizes and materials of drink containers that are littering our streets and countryside before being submitted to the Department for Environment, Food and Rural Affairs’ (Defra) upcoming consultation on the scope of this deposit return system. Similar systems around the world have helped boost recycle rates as high as 97%. Councillor Daryl Turner, Cabinet member for natural and built environment said: “Through the collective effort of local people and communities we can banish bottles and cans from our parks, towns, fields and hedgerows for good. “We’ll be counting all the bottles and cans we collect to give the government evidence to design the best deposit return system – which should help transform the countryside back to a beautiful, litter-free state. They’re encouraging everyone to come and see the reverse vending machine in action. For further dates visit the CPRE website.